Looking for Egyptian cat names? Do you love reading and learning about Ancient Egypt and its culture? Do you want to give your cat a name that is out of the ordinary? If you think that "Fluffy" lacks pizzazz and punch, consider an Egyptian cat name. Even if you don’t have an Egyptian cat, like the Egyptian Mau, you can still give your cat an exotic, beautiful Egyptian name. The list below contains Egyptian names for female cats; many of which are the names of Egyptian goddesses. Middle Egyptian was the Egyptian written from 2000 BCE to 1300 BCE (it consisted of both traditional hieroglyphs and a cursive hieroglyphs). These were the names of the gods (and goddesses) before Ancient Egyptians adopted the more popular Greek names. I hope you enjoyed this list of names for Egyptian cats. 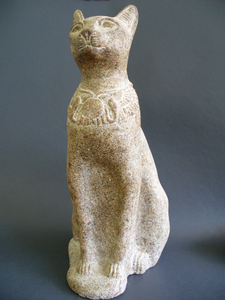 Egyptian cat names are mysterious and magical, just perfect for a cat. For additional cat names, check the links listed below.